NUFC FANS FOODBANK-ONE YEAR ON! The Nufc Fans Foodbank started operations on 26/1/2017 with a showing of “I Daniel Blake” at the Tyneside Irish Centre. That night, a shocked audience of around 100 saw the film that showed how people in our city were being starved due to failings in government social policy. We were dumbstruck. That night, Sharon Percy, who acted in the film, came to see it with us and has remained a constant friend, giving food, even when she was on the dole herself. Ian Mearns MP spoke to say that the film, if anything, understated the size of the problem. That night we raised £806 and Mick Martin of True Faith brought a couple of bags of shopping. The next Saturday 5th February, thanks to the cooperation of Newcastle United, we started matchday collections at the NUFC match vs Derby County. We got half a tonne of food and over£600 including contributions from some Schalke 04 fans who donated German food and British cash. From that day we’ve continued to grow, we’ve collected over £30,000 in cash and 14.5 tonnes of food at home matches. In May 2017 we asked the Grainger Market and Newcastle City Council to let us use a unit there (Unit 109, aisle 3) and have collected over £4,000 and 8.635 tonnes of food opening 4 days a week. Highlights have been the 10p donations from poor people, because we now know that 10p will buy a tin of beans; the £20 notes from passing Range Rovers, which will feed four families for a week; the Easter Egg donations, the 1000 Advent Calendars before the Watford match and the good hearted, decent generosity of all of our people who’ve helped and chatted and contributed. In addition we have had gigs at the Tynebank Brewery, The Grainger Market, (Benny Graham singing “Wor Nanny’s a Mazor”), The Tyneside Irish Centre and collections at the Toffee Factory. The North East Art Collective in Eldon Garden have raised over £2,500 from the work of “Serann” an artist inspired by the “I Daniel Blake” film (prints are still available). Also 2 True Faith Transfer nights have raised over £5,000 between them. We even received a special donation of 20,000 packets of cereal – including Sugar Puffs, which gave us all a smile, remembering the Honey Monster, managed by Kevin Keegan, lifting a trophy at Wembley..Let’s hope life imitates art. The media at all levels have been fair and sympathetic and have helped us get the truth out. 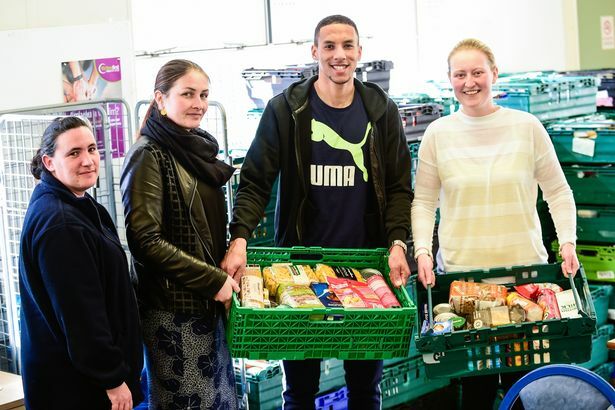 Newcastle United have been wonderful from the MD, Lee Charnley to Wendy Taylor and Lee Marshall to Rafa Benitez (who gave £300 personally) to players like Isaac Hayden who has visited the Foodbank twice. As importantly, the NUFC staff, who don’t get paid much, (Living Wage now!) but who are as close to their community as anyone collect food at home matches. Shona Alexander CE of Newcastle Citizens Advice introduced us to Mike Nixon in the first place without which we’d be a group of fans with a half-full cardboard box. Our MP’s, Chi Onwurah, Cath McKinnell and Ian Mearns (who invented the Shola chant) have been constant supporters with raffle prizes and raising awareness – including Chi’s question to the PM last week – and councillors like Joyce McCarty, Dipu Ahad, Shumel Rahman, Daniel Greenhough and others have helped in many ways. 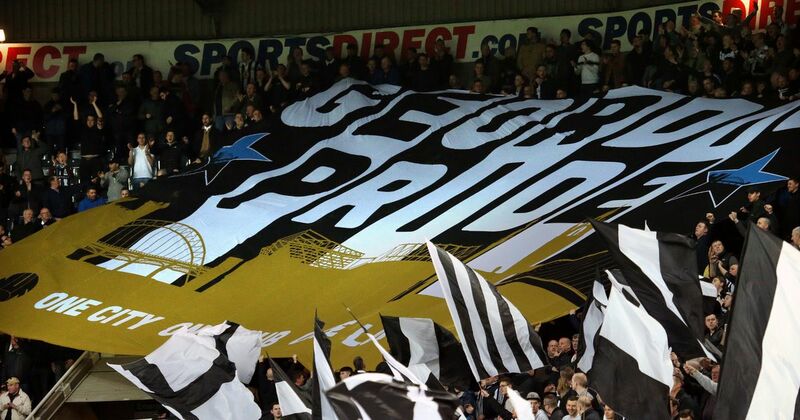 All supporters groups and the people who organise events have helped, like True Faith, Steve Wraith and Newcastle Legends, all at NUST, Nufc Fans Utd, Graeme Forster and Wor Flags who sometimes stop at our collection point to sing a song or two. The wonderful people who volunteer as collectors and get cold and wet pre-match have allowed us to collect more (sometimes £2000 per game) and feed more than we thought was possible and some of them don’t even go to the match afterwards. Finally we thank the many Junior Football Clubs who collect at SJP; we know that a collection at the match is very important to them and they’ve welcomed us and shared the same pavements in Strawberry Place. Totalling the above donations and using a Trussell Trust formula for “cheap food” costing £1844 per tonne (ours is normal food, so we’ve applied £2000 per tonne), and calling it £1 per packet of cereal, we’ve raised the equivalent of £110,000 in a year. We think this is enough to mean that the Foodbank doesn’t have to travel to London to get half of its food as it did in 2016. However, demand is going up and we need to keep going. Mike Nixon, the outgoing CE of the West End Foodbank says we’ve raised between 15-20% of their income and that, unfortunately, has been needed as the impact of austerity has hit our city. These figures don’t include the mighty work of Toonaid. Dipu Ahad and Monju Meah have produced the best black and white tops that we’ve seen for years with all proceeds going to the Foodbank. Monju has also set up a means of online donations. They’ve raised thousands but they deserve the credit for their operation and they’ll be able to tell you about that. Monju even gave the Foodbank £750 of a prize he’d been awarded for fundraising activity elsewhere. We’ve been privileged to work with and know Mike Nixon the outgoing CE of the West End Foodbank. He is a gentle man with strong faith who believes in deeds matching his words. We need to carry on his example until Foodbanks are a distant memory and we can say that when the hungry people of this city needed us, Newcastle United fans, their club, their people and their community fed them food, hope and dignity. 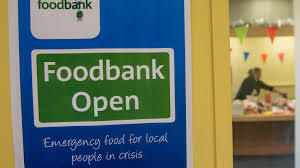 One day people will ask if there was ever such a thing as a Foodbank; we’ll tell them we had the biggest one in Britain right here and we slaughtered it….one day. Until then, we’ll be at the next home match and we will need your help, support, food and money. Stay with us and stay with the people. We are United.